Mojito allows you to establish parent-child relationships between your mojits, so parent mojits can execute child mojits and attach the content to the parent mojit’s template. The parent mojit in this relationship is called a composite mojit. The frame mojit HTMLFrameMojit that we looked in the last module is also a composite mojit. In fact, all frame mojits are composite mojits, but composite mojits do not have to be frame mojits. A frame mojit can also have a child mojit that is a composite mojit, extending the parent-child relationship. In this module, we’re going to keep using the HTMLFrameMojit and have a child that is a composite mojit with several children. To make it more interesting, one of its children is also a composite mojit with a child. The composite mojits will manage the child mojits that create our content, while the HTMLFrameMojit will continue to put together our HTML page. Do you remember all those mojits that we created earlier that have been just sitting there unused? Well, we’re finally going to use them for the application that we’ll create in this module. As you can see from the screenshot, we haven’t changed much aside from adding the header and footer to the page, but beneath the surface, we have also changed the structure of the application, which we’ll talk about shortly. Composite mojits are simply parent mojits with child mojits that can be executed by the parent with the Composite addon. This allows you to have central control over several mojits that are responsible for generating content for parts of a page, and it also allows you to share data and configuration with child mojits. Configuring composite mojits is very similar to configuring frame mojits, except composite mojits use the children object instead of the child object to define parent-child relationships. The composite mojit can also have many child mojit instances defined in the children object. Moreover, your application can have many composite mojits, but only one frame mojit. In the example application.json below, the layout instance in its configuration has defined three child mojit instances. This parent-child relationship lets the layout instance execute the actions of its child instances and then attach the content from those child instances to its template. You can imagine how our layout instance would organize the parts of the page such as the body, header, and footer, but we’re still going to need our HTMLFrameMojit to create the HTML skeleton and attached our content. To do this, we simply make our tribframe instance a child of the HTMLFrameMojit. Notice though that our composite instance is now child. // meta data, such as a template name. The ac.composite.done method is used much like ac.done. You can pass data to the parent template as well as meta data such as the template name. The method ac.composite.execute, however, requires that you explicitly pass configuration defining child mojit instances, making it more complicated to use but allows for the dynamic creation of mojit instances. // allows you to dynamically execute mojit instances. We’re not going to dynamically create mojit instances in our application, so it makes more sense to just use ac.composite.done to execute the child mojits. Based on what we’ve learned, the controller for the parent mojit Body shown below should make more sense. Based on our configuration, the body instance will execute the github instance. We’re also passing some data to the parent template, but how does the parent template attach the content created by our github instance? Well, we’re going to look at that next. In this module, we use YUI CSS to style our application. We’re not going to cover the YUI CSS in this tutorial, but we encourage you to read the YUI documentation to learn more about what the CSS does and how you can use it in your own projects. The application also uses YUI CSS for common HTML elements such as lists and forms and custom CSS (trib.css) for the containers and headings. Change to the 04_composite_mojits application. Although we’re still using the HTMLFrameMojit to create the Web page, we are also going to create the mojit PageLayout to handle the layout of the Web page. *        to the Mojito API. 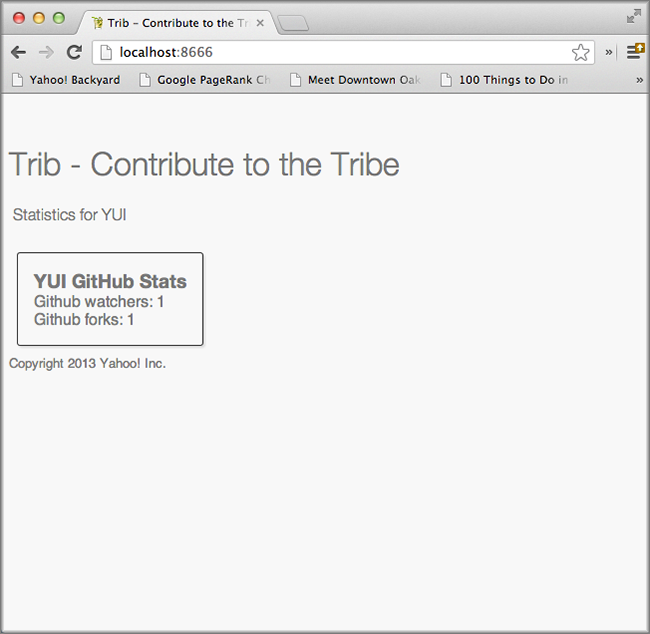 title: "Trib - YUI/Mojito Developer Dashboard"
Try running app again. It isn’t much but you can at least see the same default content being rendered three times and attached to the page. The next step is to modify our children so that we have more interesting content. Update mojits/Header/controller.server.js and mojits/Header/views/index.hb.html with the content below. Note that our controller is not contributing much because the content is mostly static. Do the same thing for the Footer mojit. Again, mostly static content, which is what you would expect from the header and footer. * to the Mojito API. title: "Copyright 2013 Yahoo! Inc."
In our application, the Body mojit is responsible for the dynamic content of our page. Let’s update the controller and template with some content. Before we run our application, let’s do a little clean up by deleting our custom template Github/views/custom.hb.html and the custom CSS (04_composite_mojits/assets/custom.css), which we will no longer be using. Start your app again to see the mocked GitHub stats that is being attached to the template of the Body mojit. The page would be more useful with real data, so, that will be the topic of our next module. If you do not see your child mojits being rendered and there are no errors, check to see that the mojit instance defined in application.json and the Handlebars expressions in the composite mojit’s template is the same. For example, if you have the mojit instance github defined as a child of the body instance, then the template of the body mojit should have the Handlebars expressions . Can you inherit the configuration of another instance that has children? Yes, the base property allows you to inherit the mojit configuration, so instead of recreating the configuration, you only need to point base at an already defined instance. See the base property in the specs Object configuration. In the example below, you can see that the mojito_frame instance inherits the mojit configuration of the mojit instance _frame using the base property, but overrides the config property with its own configurations. "title": "Trib - YUI/Mojito Developer Dashboard"
What are the differences between configuring a frame mojit and a composite mojit? What Handlebars expression allows you to attach the content of a child mojit? What are the two Composite addon methods that allow parent mojits to execute child mojits? Try replacing ac.composite.done in the controller of the Body mojit with ac.composite.execute. You’ll need to create the configuration to pass to execute. Refer to Running Dynamically Defined Mojit Instances for help. A parent mojit that has child mojits and executes those child mojits with the Composite addon.